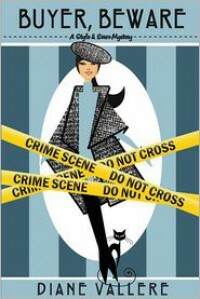 Buyer, Beware is another fun and well-written cozy mystery from Diane Vallere in her Style and Error series. I'm enjoying them thoroughly. Samantha Kidd is an out-of-work department store buyer who has moved back from New York to her hometown in Pennsylvania. Unfortunately, as we learned in the first book of the series, the job she moved back for didn't work out, mainly due to dead bodies. Now, she and her friends are trying to win a contest from the new department store in town to make some money for paying bills. The new department store is called Heist and the contest is to steal a particular piece of artwork and deliver it to the store. On the night of the reception to deliver the artwork and receive their prize, Samantha finds another dead body. Like most cozy heroines, they seem to follow her. The owner of Heist hires Samantha as the handbag buyer because of her past experience with murder investigations. Yeah, I know, that's a little lame. Amazingly, she goes straight to the police and tells them what she is doing. Yay! Someone who realizes that maybe tracking down murderers on your own is a dumb idea! It shows one of the things I like about Samantha, she's smart. I like her and I like her friends. I like the descriptions of the vintage clothes she wears. I like that she lives in her parents old house and hasn't changed anything so it still has it's 70's decor. I didn't guess the mystery until it played out so that's another reason to like it. Now if she could just find a job that doesn't involve dead bodies. Diane Vallere's mysteries are smart and fun. I'm pretty hooked on them right now. Fortunately, she has three series out so I have a few more of her books left to read. Book provided by Netgalley for review.